How might we be the place for parenting in progress, not perfection? Even experienced moms get overwhelmed and don’t always have the answers, because every baby brings a new experience. Furthermore, Target’s Baby business wasn’t adapting fast enough to accommodate shifts in shopping behaviors and was losing market share in a growing industry. We embarked on a mission to re-examine the Baby business, market forces, and the most critical parenting needs to develop a new differentiated Baby experience. After conducting design research with over 800 parents surveyed, 30 online interviews, and 10 in-home/store ethnographies, we discovered moms really need help cultivating their identities as women, generous ways to try without consequences, and empathetic shopping experiences. 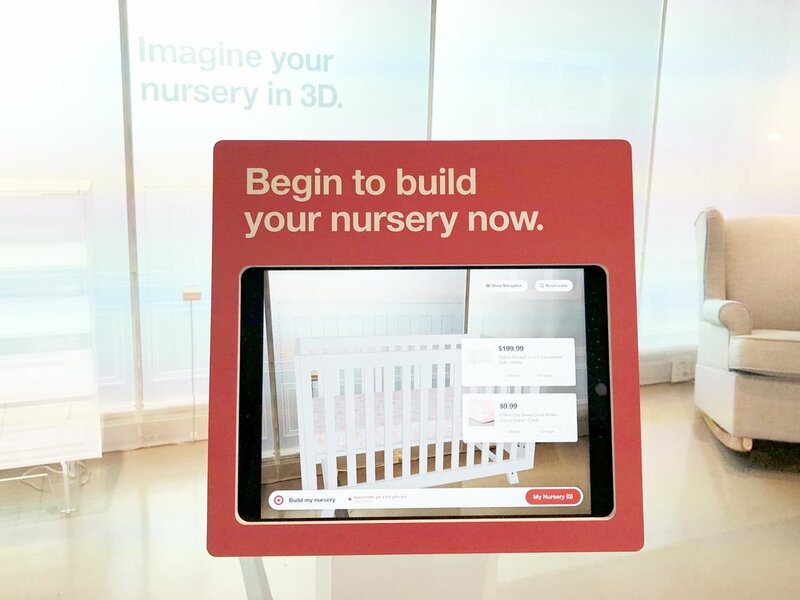 After exploring experiences from a sensory lab to a playland, our findings led to an in-store augmented reality kiosk that allows shoppers risk-free ways to visualize their perfect crib and bedding combination. The pilot program launched in September 2018 with promising engagement and conversion rates. How might we build stronger relationships and brand love with progressive benefits? Loyalty memberships are proliferating, yet shoppers increasingly feel like they care more about retailers, than retailers care about them. For Target, its most loyal customers drove 70% of sales, but were becoming less devoted and only represented a small percentage of total customers. We were tasked with rapidly exploring and experimenting the most promising loyalty ecosystem for Target to grow share of wallet and brand love. Over the course of 12 weeks, we prioritized concepts based on weighted variables for consumer value and Target value, identified the riskiest assumptions to test first, conducted 22 physical and digital experiments with nearly 7,000 shoppers, and yielded over 500 loyalty sign-ups. Based on the validated learnings, the Loyalty Team was able to confidently pilot in Dallas, TX and quickly scale its new progressive Target Red benefits program to over 200,000 active consumers with an NPS above projections. How might retailers anticipate the convergence of video, social media, and ecommerce? Video will represent 80% of all traffic by 2020. Millennials are defining future shopping behaviors as 63% of them shop on their phones daily and 47% are influenced by social media when making purchases. Additionally, Target needed innovative ways to captivate and commercialize younger audiences. Over the course of 14-weeks, our team engaged with BCGDV to identify and activate a portfolio of new growth ventures. After conducting design research across the country, interviewing industry experts, prototyping video content and mobile apps, we identified an opportunity to reach 40M new users, produce 6x more content at 80% less costs, and generate $250m+ in annually recurring revenue. Based on the validated learnings, this concept advanced to MVP alpha incubation, but ultimately failed due to weakened strategic alignment and viability. How might we help people discover and shop the world around them? In an on-demand world, shoppers are frustrated when they can’t collect discoveries the same way they collect memories – right when they happen. To that end, 67% of millennials believe shopping online has become mundane and frustrating. Retailers need a new way to seamlessly integrate into everyday lives. Our team engaged with BCGDV to explore the future of retail. After conducting design research across the country, interviewing industry experts, and prototyping mobile apps and connected products, we identified an opportunity to create a world where all physical products become shoppable by connecting people, products, and commerce through invisible technology. We validated people will in fact try to shop the world around them and validated physical products could be embedded with smart, discoverable, and buyable proximity tags. Despite early validated desirability and feasibility learnings, this concept was paused due to scalability and viability concerns. RIP. How might we help people get more value from their spaces and belongings by simplifying the path to organization? Clutter is a chronic problem and being organized “Is like a diet. It happens for a couple of days and then I give up.” Target had also given up, S&O sales and market share, as shoppers were purchasing less items, less frequently. Competitors and new entrants, however, were finding success offering new S&O services and entire solution systems. We were tasked with converging market trends and consumer behaviors into a sustainable growth strategy. Design and market research revealed two primary consumer segments and growth opportunities: Space-Constrainters who need to maximize space efficiency and functionality; and Life-Eventers who need to successfully transition through major life events, while minimizing the stress of change. We tested lo-fi digital solutions to validate what people value most from being organized, including 2 apps to help people keep track of their physical world, and a smart closet to help people get more value from their belongings. While the digital solutions never launched, the insights gleaned did influence Target’s first modular closet system. Overall, the growth strategy helped elevate Target’s S&O market share and brand affinity to second-place, behind Walmart. How might we get people exactly what they want, when they want it? The democratization of style has flooded the market with fast fashion, leaving consumers feeling unoriginal and craving uniqueness. In response, Target had declared “style” as a strategic key initiative and believed mass-customization was potentially a way to win. We were challenged with making sense of all the hype around mass-customization, what’s actually desirable, feasible, and viable for a $70b+ company with 150m customers. To answer these questions, we surveyed people about their style and how personalized and customized products might help. We quickly examined venture capital and startup activity to understand where the “smart money” was being invested. We ran scrappy experiments with makers, joined a 3d printing marketplace, and launched a series false door digital tests. We explored everything from bespoke to monogramming, apparel to home decor, 3d printing to screen printing. people don’t care about mass-customization, they just want what they want. For Target, the lifetime value was too low, acquisition costs too high, and market sizing too small. RIP. How might we help families rediscovery the joy of weekday dinner? Figuring out what to make for dinner is a daily dilemma, and 53% of dinners in America are planned within just one hour of eating. Unfortunately for Target, its dinner assortment was also an afterthought for many shoppers. We set out to define a consumer-driven strategy and validate a portfolio of innovative solutions to make Target a destination for weekday dinners. After interviewing 12 families in their homes and conducting 32 online dscout missions, we discovered families are ultimately seeking dinner solutions that help foster connections with loved ones and add a little variety to their most reliable dinner routines. How might companies recruit, retain, and develop top talent from a community perspective, not a corporate perspective? The next generation workforce finds reward in collaboration, gravitates towards innovation hubs, desires purpose-driven work, and favors mentorship over management. Many companies are not prepared for the future workforce and are challenged with lower retention rates. We accepted the challenge of giving the Twin Cities’ most talented people better connections, a safe place for dangerous thinking, and the opportunity to meaningfully impact local communities. After interviewing a half-dozen Fortune 500 companies and dozens of local diverse talent, we learned the novelty of a new challenge, in a new place, with new people brings out the best in everyone. We created Plus One, an experimental group that convenes 25 of the brightest minds from all backgrounds to work towards a common purpose-driven goal. The first mission improved the Minneapolis Institute of Arts’ loyalty program by bringing “show me you know me” to life with simple experiential gestures and making it easier for people to donate online.